TORONTO - Threats of a June election in Ontario eased considerably Friday when the New Democrats said they were "encouraged" by Premier Kathleen Wynne's response to their series of post-budget demands. Even though the minority Liberal government included a list of NDP ideas in the May 2 budget, party leader Andrea Horwath issued three additional demands that she said were necessary for her support. The two leaders met in the premier's office Wednesday so Horwath could clearly outline her second set of proposals, and Friday morning Wynne issued a statement agreeing to one, offering a compromise on another and rejecting a third. The Liberals agreed to introduce legislation this fall to create a Financial Accountability Officer to provide advice to MPPs and legislative committees on the province's finances and the costs of proposed spending initiatives. "This new officer would be independent of the government," Wynne said in her statement. The premier also said the government would introduce new accountability measures across the health care system, but she stopped short of agreeing to the New Democrats' demand to give the ombudsman oversight of hospitals. However, Wynne said the Liberals will stick to a plan to allow motorists without passengers pay a toll to drive in car pool lanes, something the NDP condemned as "Lexus lanes" and demanded be dropped from the budget. Horwath issued her own statement Friday in response to the premier, and said she would hold a news conference next week to say if Wynne's response was good enough to make sure the budget will pass. "As it's always best to be clear and upfront with Ontarians, I will hold a media availability on Tuesday morning at Queen's Park to respond." Horrwath had said earlier she wasn't drawing any lines in the sand, and her statement Friday did not indicate the NDP would argue that only the ombudsman could make hospitals more accountable. "I am encouraged that Premier Wynne is willing to put in place some of the accountability measures that Ontarians want to see," said Horwath. "New Democrats have worked hard to ensure the provincial budget is fair, balanced and accountable." 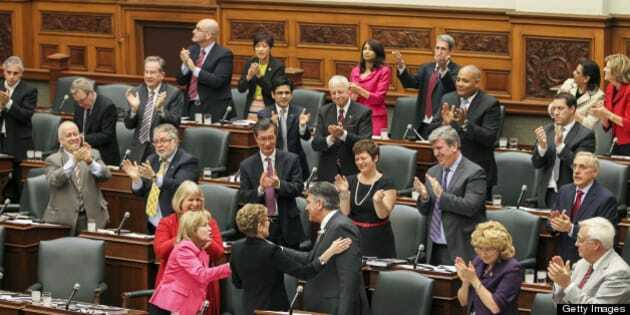 On the one idea Wynne rejected outright, the premier noted there will have to be legislation to create the so-called high-occupancy-toll, or HOT lanes, so that would give the NDP and Progressive Conservatives a chance to outvote the Liberals and kill the idea. The Tories oppose any new tolls on existing highways. They have vowed to defeat the budget in hopes of triggering an election, so the Liberals need the NDP to make sure the fiscal plan gets approved by the legislature. Wynne had earlier expressed frustration with the NDP's latest series of demands after the government included many of their proposals in the budget, including a promised cut in auto insurance premiums, higher welfare rates, a youth jobs program and more money for home care services.